Aaron Adams uses his fish research to formulate his fishing strategies, and his fishing to help guide some of his research. He has a Ph.D. in environmental biology; a Master’s degree in marine science; holds a Coast Guard Captain’s license; has lived, worked, and fished in Maryland, North Carolina, California, Virginia, the US Virgin Islands, Massachusetts, and Florida; and has conducted fish research throughout the Caribbean. Aaron Adams, Ph.D., a marine biologist understands the habitats that warmwater coastal saltwater gamefish live in. Knowing something about a fish’s life cycle and behavior patterns will give you a better idea of when and where you’re most likely to find fish. 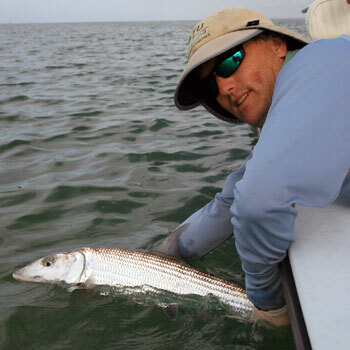 He is a senior scientist at Mote Marine Laboratory and director of operations for the non-profit Bonefish and Tarpon Trust. His pursuit of fisheries and habitat conservation are rooted in his years growing up near Chesapeake Bay, when he witnessed the collapse of the Bay’s habitats and fisheries. He is an avid fly angler, but manages to squeeze in some time to translate science and conservation into fishermen’s terms. To that end, he has authored three books and is a co-author on another, has authored many magazine articles, has been part of TV shows applying fish science to fly fishing, is the publisher of two web sites (fishermanscoast.com and tribalbonefish.com), and has given countless presentations to fishing clubs. After all, if anglers learn more about the fish they pursue, they will become better anglers and better stewards.